For the past couple of years now it’s become a tradition for my cousin and I to spend a long weekend with my aunt and uncle at their house in Bethany Beach, DE. Even though it’s just the two of us, we call it a girl’s weekend. Each year is pretty similar, we do some shopping at the outlets, hit up the pool or the beach, capture a sunrise or two, visit our favorite restaurant and talk, talk, talk. My husband likes to joke that when my mom’s side of the family is together (nearly all women) that we do nothing but talk and the sheer volume we produce from conversations can overpower anything the men are trying to watch on television. A tradition that my aunt and uncle have is that happy hour is at 7 pm and dinner is at 8 pm. While that may seem like a late dinner to some, it really works out perfectly when you’re on vacation and can’t bring yourself to get off that pool chair or walk out of that one last store. Happy hour sometimes comes with an appetizer or two, and before we even got there I had a plan of what we would enjoy one evening. While the origins are debated, you’ll find an orange crush on just about every menu in Maryland. A light summer drink made with fresh orange juice, vodka and triple sec. 2. Pour in vodka and triple sec and top with orange juice. Stir and enjoy. It doesn’t get much simpler than that, does it? A perfect pairing for a light drink like this is an equally light snack, especially when you already have a delicious dinner planned. The last thing you want to do is fill up on your appetizer, right? 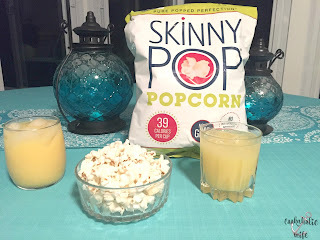 An easy appetizer choice is popcorn, like the original version of SkinnyPop. With only 39 calories per cup you can’t even feel bad about eating a handful or two (or lets be honest, five) while you’re talking with friends and getting dinner prepared. SkinnyPop has a variety of flavors you can choose from and created this handy image showing what type of drinks pair best with their flavor variety of popcorn. If an orange crush isn’t your thing and maybe a Moscow Mule is, it also pairs perfectly with their original flavor. 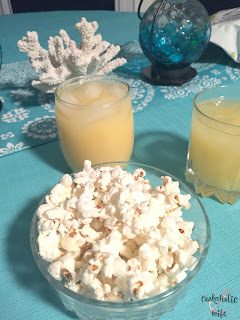 Or maybe you’re feeling spicy and want to munch on some jalapeno flavored popcorn and what better way to cool down your tongue with a refreshing coconut margarita? The popcorn flavor and drink combinations are endless and I don’t know about you, but this really makes me want to have another party and check out all of the pairings they’ve suggested! 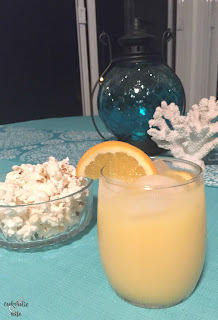 Also, in case you are having a few people over and don’t want to get stuck making drinks as they arrive, you can easily increase the orange crush recipe ingredients to fill a pitcher and then leave out so your guests can serve themselves! Without ice and covered, the drink will keep in the refrigerator overnight as well.